The development of efficient routes to pyrazines and their ring fused analogues is an attractive area of research since these compounds are now widely recognized as important N-heterocycles for their potential use in medicinal and agricultural scientific fields. 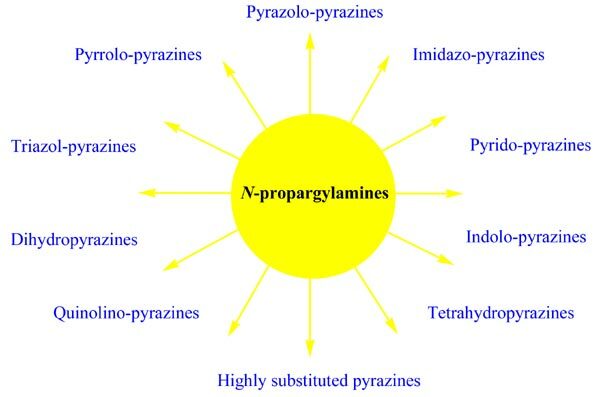 In this review, we describe the most representative and interesting methods for the synthesis of pyrazines from N-propargylamines. Mechanistic aspects of the reactions are considered and discussed in detail. Pyrazines, ring fused pyrazines, N-propargylamines, 6-exo-dig cyclization, 1, 3-dipolar cycloaddition.